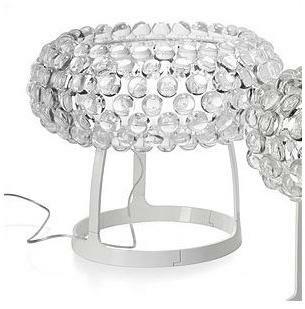 The Foscarini Caboche table lamp will sit nicely on a chic dresser or indeed your night stand or table. For added bling you might do both! The blown glass shade and matt white finish are stunning but I love the fact that this light creates both upward and downward glowing light to give a quite brilliant lighting effect. The light fitting and “shade” sit on a white laquered metal base. Designed by Patricia Urquiola dn Eliana Gerotto, the Caboche table lamp has personality and will add to a contemporary glamorous bedroom. It can of course be used to great effect in a number of rooms in your home. This table lamp is available in transparent (pictured) or yellow gold. The good news! The Foscarini Table Lamp is currently available at an incredible 44% discount (at time of writing) at All Modern Furniture.